Make an informed decision about buying triple glazing, let us to assist you in deciding whether triple glazing is right for your needs. What is the big difference between a energy efficient window and a "normal" window? There are some big differences between the various types of windows on the market today. A good window is suppose to reduce the heat during the summer and enhance the heat during the winter. This is one of the reasons why its so important to select windows carefully. To invest money on new triple glazed windows will defiantly result in a higher effective yield than the most lucrative interest rate on the market today. As if that was not enough it will also contribute to a healthier environment since every saved kilowatt hour reduces the carbon dioxide emission by one kilo. Similar legislation could soon be introduced for the window market since about a third of the heat loss in a normal house is caused by poorly insulated windows. Energy is not something we can discover by the naked eye and hence factors like price and aesthetic appeal tends to be taken into consideration before the energy performance comes to purchasing windows. This results in that a large number of homes throughout out the UK and North America are wasting energy by having poorly isolated windows which in turn leads to increased heating bills. The second law of thermodynamics states: "heat does not flow spontaneously from a cold material to a hot material, but it allows heat to flow from a hot material to a cold material". In other words heath loss occur when heat flows towards colder materials through the shell of the house. By this we refer to the floor, roof, walls and windows. The heat loss in windows mainly occurs when the heat in a room finds its way out throughout the glass and the frame of the window. Though this is not the only way heat loss can occur throughout a window. As we mentioned in paragraph 2.1 (The Structure Of Triple Glazing) greater insulation can be provided by filling the gaps between the layers of glass with gas this creates less thermal conductivity. We have yet to wait for a regulations defining an energy performance standard that would be very helpful within the market for windows. Window manufacturers throughout out Scandinavia have started a project together with the authorities in order to create a standard for energy performance. The purpose of this project is to help consumers to chose energy efficient windows, reducing emissions and reducing the cost of heating bills. To find the authorities and the manufactures, all of whom produce triple glazing, by navigating to the link archive. The UK Government's Code for Sustainable Homes points the way forward in Britain. The aim is to produce zero net carbon emissions from new homes from 2016, and the code specifies a target for windows of 0.8 U. The U-value is the standard measuring system for energy performance. In order to give more of an insight into the terminology that exist around windows and energy performance a short glossary is given below. To sum this paragraph up triple glazing is the way ahead. When thinking about buying triple glazing knowing the following items can be of great use. Please notice that a few things will be explained more thoroughly in later paragraphs. This is a measurement that tells us the percentage of daylight that is enabled to pass throughout a window. The measurement resembles the daylight transmittance measure but the solar energy transmittance tells how much of the daylight heat that can pass throughout a window. Solar energy is of course free energy so a high solar energy transmittance means a higher amount of free energy. For normal residential houses a recommended window should provide a solar energy transmittance over 50%. One important thing that should be mentioned is that with a large window area facing towards south it might be advisable to chose a window with lower solar energy transmittance to prevent the heat from being becoming uncomfortable. In this paragraph the term U-Value will be evolved. U-Value is today the standard measuring system for energy performance, with lower scores indicating greater efficiency U-Value can be defined as a building's (or a part of a building's) thermal resistance. It is indicated in units of watts per squared meters per Degree Kelvin [or W/m²K]. Note that Kelvin is used as the scale of temperature difference, but this is numerically equal to Celsius. So to break this down in easy terms the U-value tells us how great the heat loss is for a part of a building or the whole building in itself. The heat losses through a building's windows makes up a massive part of the total energy/electricity bill for a standard household, in a normal house the costs for this particular heat loss can reach around 15-20% of the total bill and as described earlier it can even reach up to a stunning 33% depending on the circumstances. U-value is calculated on a windows whole construction, including the frame and the amount of glass layers being used. However this is not all, as we described in paragraph 2.1 there are other factors that can help a window to decrease its U-Value. Such a gas between the layers of glass and a low emissivity coating. A low emissivity coating on glass drastic changes its characteristics. Preferably what it needs to achieve is to allow short wave length sunlight to enter a room and heat it and to achieve a large reflection on the long wave length sunlight, thus the window minimizes the existing heat loss that exists around all windows. To read more about low emissivity coating and gas go to paragraph 2.1 (The structure of triple glazing). The following example shows how the U-value fluctuates when adding one or two low emissivity coatings and gas, to double glazed and triple glazed windows. Windows that have low U-values has a higher temperature on the inner layers of glass compared to windows with high U-values. This means that the risk for down draught decreases and the comfort on the inside increases. In a room with a high humidity the risk of getting condensation will decrease significantly with triple glazing. To read more about condensation navigate to paragraph 3.3. Most triple glazing manufacturers produce windows with a U-Value of 1.3 W/(m²K) as standard though having said that there are constantly new improved products being presented. To see what type of windows that are being manufactured right now please visit our link archive and navigate through to the different manufacturers sites. The inner layers of glass are not just affected by the U-value but also by other aspects such as the humidity inside as well as on the outside. The table below shows the temperature on the inner layer of glass, the different parameters used are: a room temperature of 20 degrees Celsius and the variable outside temperatures are -10 °C and -20 °C. These temperatures are showing how efficient triple glazing can be. Therefore the way to decrease energy and electricity bills is to switch to triple glazed windows. The decrease in energy usage is of course depending on how much the U-Value improves. As mentioned earlier the temperature plays a big roll in the energy game. This means that depending on the area the results may differ. For instance up north in the colder climates the efficiency of switching to triple glazing will be more apparent than in warmer climates down south. As an example take a small house house with a complete window area of 16m². By changing the existing windows with the U-value of 2,5 to new triple glazed windows with the U-value 1,3 there will be a big change in the energy/electricity bill. Where this house located in Canada or Scandinavia the saving could be up to 3000kWh per year but where this house in the UK the saving would be more towards 1500kWh per year. One square meter of a standard single glazed window will transmit about 5.6 watts of energy for each degree difference either side of the window or a U-Value of 5.6. A double glazed window will be significantly better with a U-value of 1.8 i.e. Only transmitting 1.8 watts of energy in similar conditions and a triple glazed window will have a U-value of as low as 0,8, being over twice as effective compared to a double glazed window. It should be mentioned that some manufacturers are already producing triple glazed units at 0.5 U. Older double glazing would get a value of 3, but this has been improving over the years with technical advances. In using optimum spacing between the panes, inert gas rather than air and low-emissivity coatings, there has been major progress. Current UK Building Regulations specify a maximum U-value of 1.8, which is as good as air filled units can achieve. This is equivalent to that achieved by nineteen eighties triple glazing. As a comparison the current U-value required for walls in the UK is just 0.3! The UK Government's Code for Sustainable Homes points the way forward in Britain. The aim is to produce zero carbon new homes from 2016, and the code specifies a target for windows of 0.8 U. So triple glazing is the way ahead. Daylight or sunshine plays a big role in peoples fitness. If people do not get enough sunshine the immune defenses will start to decrease and the body will not produce enough vitamin D. Sunshine is also important in the way objects, people and our surrounding are perceived. If this was not enough, sunshine also affects peoples circadian rhythm and the ability to concentrate for long periods. So to sum up sunshine is a vital in order for humans to work properly. To achieve the optimal amount of sunshine in a room the total area of the windows should cover 10-12% of the total room area. A room the size of 20 m² hence needs a window area of 2-2.4 m². Most of the sunshine passes through the glass but a little is absorbed by the glass and a similar small amount is reflected. This causes a reduction in the amount of sunshine that is allowed to pass through and this happens with all layers of glass, meaning that triple glazing has a disadvantage against double glazing. A normal double glazed window lets through up to 80% of the sunshine compared to the triple glazing that normally lets through 75%. If the windows are equipped with low emissivity coating this numbers are maybe reduced by up to 10%. The recommended amount of sunshine that should be let in into our houses is 63%. So triple glazing still remains a very good alternative. The part of the sunshine that gets absorbed in the glass heats it up which results in some secondary heat since this heat gets disposed either outwards or inwards. Secondary heating is normally used as added heat to a building. The amount of heat that can enter a building depends on very much the same things as sunshine. The recommended amount of heat that should be let through is around 52%. The table below shows how the different types of windows let through different amount of heat and sunshine. Please note that these values are not 100% accurate since they wont take gas or other various types of coating into consideration. Luminosity can also be expressed in LUX which in advance terms can be explained as followed: (Please skip the following few sentences if you feel tired or don't want to listen to technical mumbo jumbo, this is only for the very interested.) LUX is in short a derived unit based on lumen and lumen in turn is a derived unit based on Candela. One LUX is equal to one lumen per square meter, where 4π lumens is the total luminous flux of a light source of one candela of luminous intensity. In other words: 1 LUX = 1 lumen-m–² = 1 candela-sr-m–². To make the relation between daylight and LUX a bit more comprehensible we below introduce a table with both measurements. Please note that these measurements have been calculate on the base that the luminosity outside is set between 3000-8000 LUX. There are many different recommendations regarding how high the luminosity should be in different rooms, bathrooms and kitchen should normally have around 500 LUX where as normal rooms have lower recommendations around 300 LUX. The shape of the windows frame has a great importance for how the daylight in a room will be presented. Old school widows are generally painted white on the inside and this was done in order to achieve the best amount of daylight. Newer windows tend to have a sharper outline which does not transmit the daylight as well nut by shaping the corners it can give a softer presentation. It should also be mentioned that light that entering a room from low placed windows will not be as effective as light that enters from high placed windows. This is because the direct daylight can reach further into the room if it enters from a high point. Daylight that enters close to the top of the window can be four times as effective as the daylight that enters in the lower part of the window. This means that a small high placed window can be more effective than a larger low place window. Accordingly a skylight window placed in the right direction will let in more daylight than any other regular window. During the hotter parts of the year the secondary heat that windows produce can become too intense. An illustration would be how hot a conservatory can become under a scorching sun. By using different methods of cooling this heat can be reduced, unfortunately this is often a very expensive method. A cheaper and more environmentally acceptable method is to use different types of sun blockers. This helps not only to prevent the secondary heat but also the direct heat. Sun blockers can be placed either outside, inside or between the layers of glass and their efficiency depends on where they are placed. The best way to place sun blockers is to put them on the outside of the windows. These types can be fixed or movable and come in all different shapes e.g. awnings, sunblinds and porches. Windows sometimes have the advantage of being placed further into the facade, something that gives them automatic sun blocking from the building itself. One disadvantage with fixed sun blockers is that they do not normally cover sunshine during the whole course of the day. This however is not a problem since sunshine often is welcomed later on in the evenings. Movable sun blockers e.g. blinds and awnings often have the capability to cover the whole window if needed, these type of sun blockers should always be installed so that there exists a gap of air in between the window and the sun blocker when in use. Sun blockers on the inside are not as effective as the outside versions. This is because the secondary heat can still exist as most of the sunshine still gets absorbed by the window. These however are the most normal types of sun blockers as curtains and venetian blinds exist in almost every household. Condensation can appear on the outside and on the inside of the glass. With both double glazing or triple glazing there is a chance that condensation can appear between the layers of glass. The reason why condensation appears is because a high humidity comes in contact with a cold surface. In this paragraph we will clear up the term condensation and the different types that are related to a multi-layered window. As mentioned earlier energy efficient windows prevent heat loss, this results in that the outer glass becomes much colder than the outer glass in windows with a higher U-value (in other words windows with less insulation capabilities). If the outer glass temperature sinks below the temperature in the air at the same time the humidity outside is high condense will appear on the outer glass. If the temperature on the glass sinks below 0°C there is even a risk that ice crystals may appear. This often happens during the autumn when the sky is clear and the humidity is high. This type of condense is nothing to be worried about, it is actually just a sign that the window has good insulation capabilities. Condensation often disappears during the early morning hours as the air starts to get warmer. A research regarding the climate was recently carried out by the Swedish department for testing and research. The study was carried out in Stockholm and showed how the phenomena condensation often appears during August, September and October. The condensation was most active during the earlier hours of the day and quickly reduced after 6 am. Old windows sometimes gets condense on the inner glass, this is something that normally occurs during the colder parts of the year. The main reason behind this is that the window has poor insulation capabilities, as a result it makes the inner glass a lot colder than the room itself. When the hot air inside the room hits the cold glass the condensation appear. There are many other ways that condensation on the inside can appear, it can be anything from a bad ventilation system to a really high humidity, its not uncommon that curtains prevent the air close to the window from circulation and thus condensation appears. Condense on the inside is different from the outside version as this type of condense is actually harmful. If condense on the inside is allowed to remain for a long time the window might be permanently damaged since its not constructed to prevent moisture from the inside. This type of condensation can appear if hot and humid air leaks into the gaps between the layers of glass. A reason for this could be that the house has an overpressure (air pressure above that of the atmosphere) thus the air is forced into the window through cracks. A working ventilation system should normally take care of the overpressure. Air can only get forced through cracks if the window has been not been sealed properly between the frame and the casement. Another common reason that enables air to get through is cracks made from fixings for blinds. If condensation appear in between the layers of glass it is advisable to switch to more energy efficient windows such as triple glazing. Heat loss can occur in many ways. To increase the perception regarding heat loss the following illustration maybe helpful. 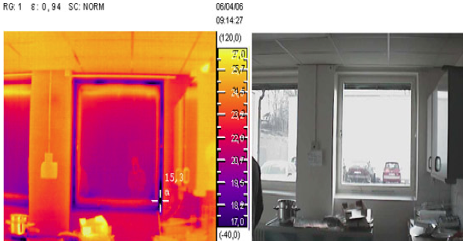 The picture is from the Swedish authorities of Energy and show the heat loss poorly insulated window. Please note that this link is available in our link archive. The pictures below has been taken with a heat camera, in between the pictures there is a scale that explain which colors that represent the different temperatures. The left hand imagine show the room has an average temperature equivalent of 25 degrees Celsius and yet the area around the window frame it is only 17 degrees. According to the laws of thermodynamics these differences in temperature will cause air streams inside the room.(drafts). To secure this problem the windows has to mean draught proof. In this picture the blinds are not in use, they are represented by the yellow line underneath the top of the blue frame. During cold nights energy and heat can be preserved by closing the blinds. The directory of triple glazing suppliers. © Copyright 2018 BB Online UK Limited, Reprod uction partial or otherwise is strictly prohibited.